It’s the final day of 2013, and the final Daily Deal in the Countdown to 2014 is a big one: Call of Duty: Ghosts. 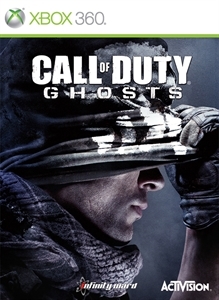 Don’t forget: Call of Duty: Ghosts is on sale today only. Come Wednesday, the Daily Deal and these special weeklong offers will be gone, so don’t miss out. Have a fun, safe, happy new year, and we’ll see you in 2014! Think you could make it in a world swarming with zombies? Hone those survival skills at a hefty discount – today only. Daily Deals continue all the way through December 31, so be sure to visit again tomorrow, and to take advantage of these weekly deals. If you let the Trials series pass you by, now’s your chance to catch up. Trials HD and Evolution, along with associated Add-ons are on sale today only. These aren’t the only great discounts to be had this week, click here to see the full list of Weekly Deals. Today only: save on NBA 2K14 and associated Add-ons for Xbox 360. More Daily Deals incoming tomorrow, joining a number of weekly deals continuing through December 31st. Today’s Daily Deal pairs well with this week’s weekly deals; the first chapter of The Wolf Among Us is free all week. Don’t miss your chance to lock down the rest of the story at a sizable discount. Drop back tomorrow for a new daily deal; check out this week’s sale list in the meantime.